No matter what you want to write, Scrivener makes it easier. Whether you’re a planner, a seat-of-the-pants writer, or something in between, Scrivener provides tools for every stage of the writing process. 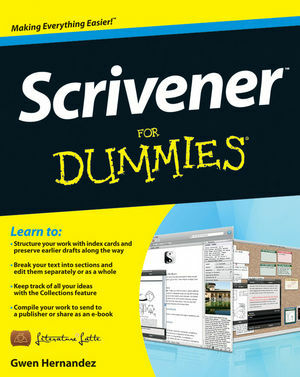 Scrivener For Dummies walks you step-by-step through this popular writing software’s best features. This friendly For Dummies guide starts with the basics, but even experienced scriveners will benefit from the helpful tips for getting more from their favourite writing software. From idea inception to manuscript submission, Scrivener for Dummies makes it easier than ever to plan, write, organize, and revise your masterpiece in Scrivener. Gwen Hernandez conducts online training courses in Scrivener. An aspiring romance author, she has worked as a programmer, a business school instructor, and a manufacturing engineer.